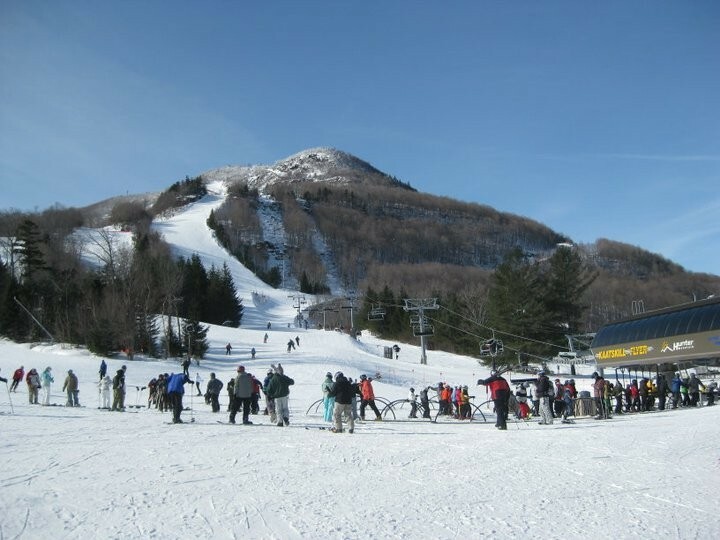 As the Great Northern Catskills' premier winter destination, Hunter Mountain, New York resides only about two hours to the north of New York City and sits at a base elevation 1,600 ft. with a summit that climbs to 3,200 ft. Hunter Mountain maintains renowned terrain across three separate mountains, with high-efficiency, state-of-the-art snowmaking that covers 100 percent of its trails, hence its "snowmaking capital of the world" reputation. The ski resort is so confident, in fact, that it offers a Hunter Mountain Snow Guarantee whereby skiers and riders within a certain time window of purchase can turn their ticket in for a voucher good until the end of the current season. The ski area also boasts an award-winning Learning Center and programs and an entire dedicated training mountain designed for beginners and families alike, Hunter One. The mountain's terrain is split evenly between beginner, intermediate and advanced trails, along with 10 percent expert, and seasoned skiers and riders will get their fix on the expert terrain of Hunter West and Empire Terrain park. Numerous B&Bs, inns, hotels and motels are available in the area, as well as a few luxury slopeside lodging options. Ski shop, full service store, and boutique. Clinic and first aid at the area. Complete shopping, drug and liquor stores, and cleaners in Hunter and nearby Tannersville. Childcare is available. Lessons and rentals are also available.